We love eating yogurt around here. Yogurt and fruit is the #1 dessert in this house. Not only is it healthy, full of calcium and protein, it’s also creamy, cold, and delicious! This yogurt panna cotta was an experiment to “fancy up” our typical evening dessert. As I knew it would be, it was a hit. It’s a very light, refreshing dessert– perfect for summer evenings! I would even venture to say it’s healthy enough to eat for breakfast. To make it easier to digest and lower in fat, I used coconut milk and plain yogurt in place of the milk and heavy cream typically used in panna cotta. 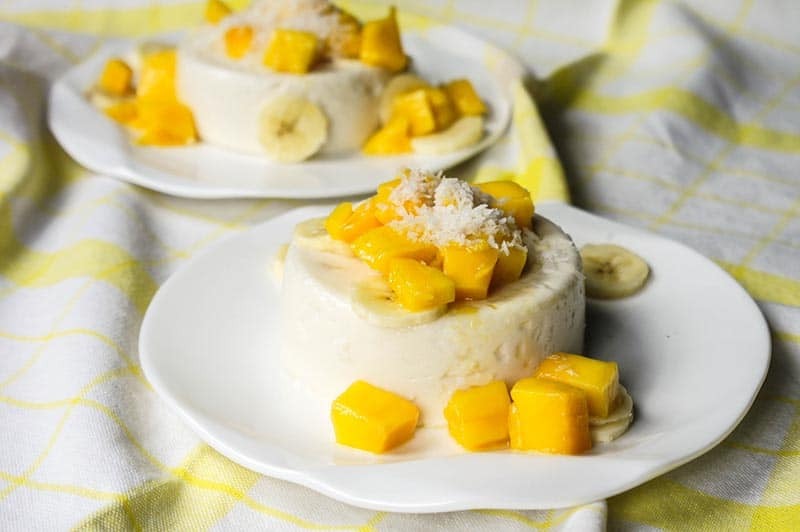 The coconut milk gave it a bit of sweetness and richness, and the yogurt added the tang I love with sweet fruit like mangos and banana. 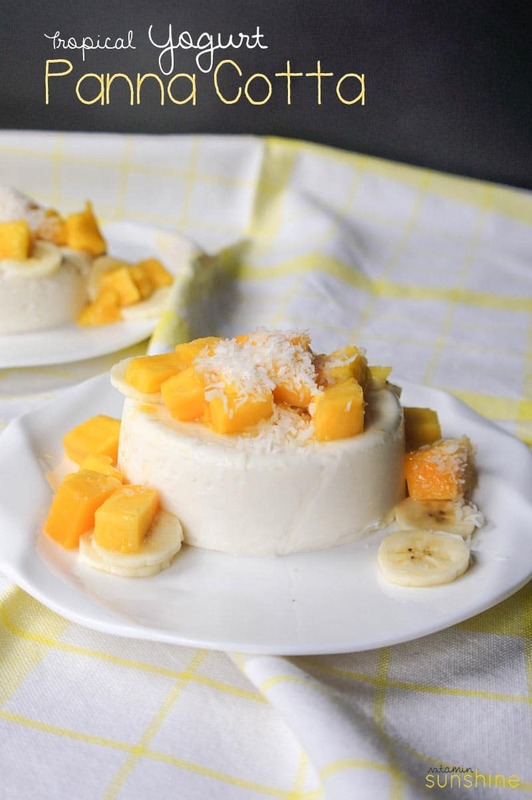 I topped ours with mango, banana, and more shredded coconut. Any fresh summer fruit would be good, especially berries. Cherries! That would be amazing. Gelatin is rich in glycine and proline, two amino acids that are used in the creation of our hair, skin and nails. Consuming gelatin regularly promotes shiny, strong hair, strong fingernails, and also helps our skin heal from sun damage, preventing wrinkles. Glycine counteracts the effects of norepinephrine, a stress hormone that causes anxiety. And because it’s all natural, there aren’t side effects (except a healthier body! ), and doesn’t leave you feeling groggy in the morning. Frequently allergies, food intolerances, and digestion issues are actually caused by low acid in the stomach. Gelatin protects the lining of the stomach, absorbs water and keeps the digestive tract running smoothly. I currently use gelatin, but not consistently. I am running an experiment on myself, and plan on incorporating 1 tablespoon of gelatin into my diet daily. I am hoping I see an improvement in my numerous food allergies and intolerances. Popular detoxes often ban consumption of meat and other proteins, leading to high blood sugar levels, and sugar crashes that cause bad moods! I’ve tried my share of those “grumpy” detoxes. The glycine found in high levels in gelatin is necessary for the liver to properly detox our systems. Maybe detox diets should include chicken and vegetable soup. 5). It’s High Quality Protein! Protein is essential for building muscle, stabilizing blood sugar levels (to keep you full), and keeping bones strong. High quality protein is difficult to incorporate when you’re busy. Adding gelatin to smoothies, oatmeal, or drinking it with warm water and lemon, are easy ways to bump up your protein intake. 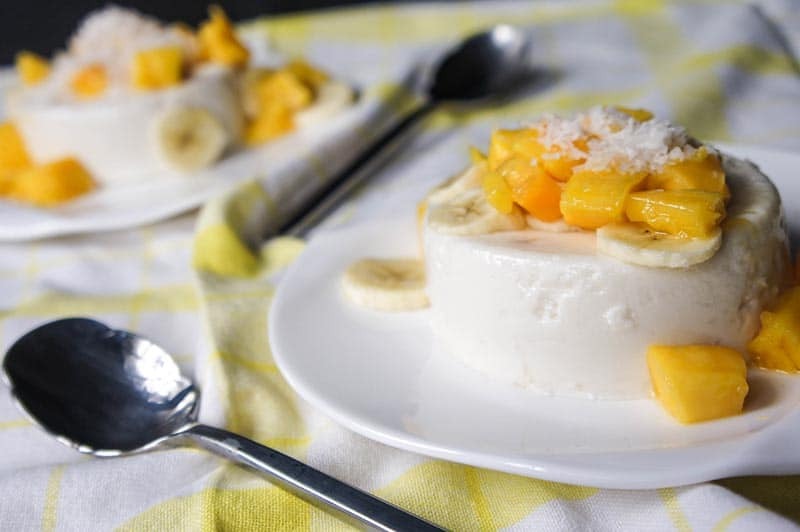 You can also add gelatin to snacks, like cookies, homemade gummies, or this delicious tropical panna cotta! A lightened up panna cotta made with coconut milk and yogurt. A beautiful, light summer evening dessert. In a small bowl, add gelatin to ¼ cup of coconut milk, and allow to soften for 1-2 minutes. To a saucepan, add the other ¼ cup of coconut milk, and heat over medium-high heat. Once the gelatin is softened, add the mixture to the saucepan. Use a whisk to break up the gelatin until it's fully mixed into the coconut milk. Bring to a boil, and allow to continue boiling for 1-2 minutes. Remove from heat, and mix in yogurt, shredded coconut, honey, vanilla and ginger powder. Divide the mixture into 4 ramekins for larger desserts, or 6 for smaller desserts. Let cool to room temperature, then refrigerate for at least 4 hours. To serve, remove from ramekins and top with fresh fruit and coconut. They are also wonderful "pudding" cups eaten just plain. If subbing a different milk for the coconut milk, I suggest adding ½-1 tablespoons more honey. The coconut milk is sweet on it's own. I’ve also been working on some other fun gelatin recipes. My first 3 trials were flops — I tried to make the recipes with pineapple and mango, and apparently both of those fruits (along with kiwi and fresh figs) have enzymes that prevent gelatin from setting. I ended up pouring quite a bit of slimy-gelatin fruit puree down the sink this week! It hurt, since I have to order the high quality gelatin I use from the States and bring it back over here! Leave a comment below to vote on the fruit used in my next gelatin snack or dessert- I am thinking watermelon or strawberries!